Football has always been a major place in my life, once it became apparent It wasn’t possible for me to play professionally, I immediately wanted to start coaching. When Sean, CEO of We Make Footballers and a long time friend, invited me to watch an U7 game, I was blown away by the talent on display. This experience strengthened my desire to help young children on their football journey. Since, I have coached and scouted for professional clubs alongside running my franchise. Prior to starting my own franchise, I worked at We Make Footballers as one of the academy managers. I’ve been involved in the company for a long time and becoming a Franchise owner seemed like a natural progression. Prior to starting my own franchise, I worked at We Make Footballers as one of the academy managers. 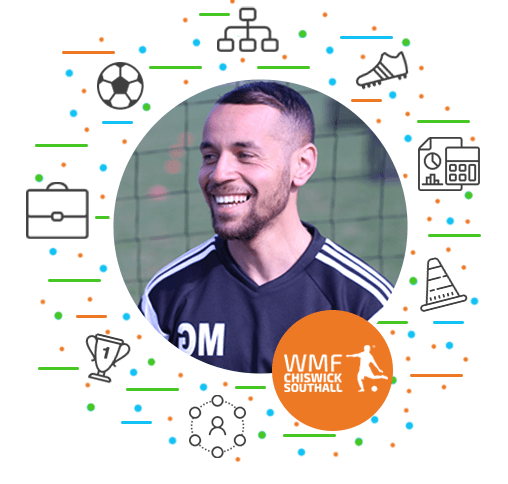 Setting up the franchise was a daunting task at first, however, with the help of the We Make Footballers it was made simple and stress-free. WMF have made this a great opportunity and ensure that every Franchisee feels welcome and cared for. I have a really good knowldege of football but really appreciate the business support which I get from the WMF Head Office. I get help with financial planning, sales, marketing and operational support. I would strongly reccomend any football coaches looking to start their own football business to speak to WMF first. expanding elsewhere. I’m enjoying the challenges and the experience, thus far, has been an incredibly positive one. Ready to build your football empire?